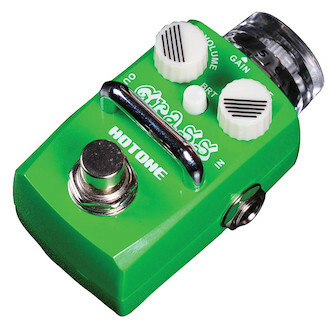 The Hotone GRASS Overdrive Stomp box will give your guitar an artistic overdrive sound. Featuring great dynamic response, the Grass pedal will provide you with sounds ranging from a tasty light overdrive to a juicy medium low distortion. Grass is perfect for capturing a brilliant tone that players of all styles will wish to emulate. Based on the sound of the legendary DUMBLE amplifiers, here is an iconic retro overdrive tone, warm, smooth, and vital, with great sounding details and a wide range of dynamic response.